Packing for Vermont 100: What do you really need? As the big date creeps closer, now is the time to start that race execution plan, do any last-minute gear shopping, and pack. With aid stations located not much than 5 miles apart, you can be relatively conservative about what to carry, and what to leave in your drop bags. 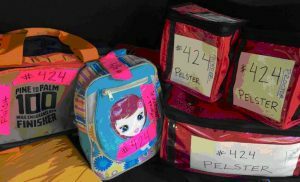 Whether you’re running solo or getting help from crew and pacers, pre-race organizing is essential. This process is prime mental preparation and helps focus some of that squirrely taper energy. If you’re being supported by crew or pacers, we recommend holding a pre-race meeting with those awesome folks to discuss each of the below points. Be sure to print the runner handbook and crew directions before traveling to the race. Cell and GPS service is very poor in this area. No really… it’s BAD. a) Review the pace and aid station times you anticipate hitting. 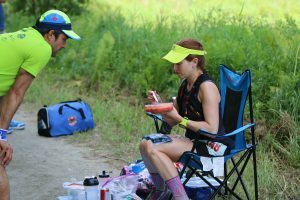 It’s helpful to download this aid station list and add columns for 2-3 projected finish times and key aid stations arrival times. c) Make back up plans for when challenges arise; because they will happen. Consider how you’ll manage weather impacts such as heat or rain, plus back-up plans for fueling and hydration. d) Discuss how you want to be supported psychologically. Are you someone who wants positive encouragement or tough talk? Does it help to be reminded of your “why”? Do you like jokes, stories, songs, or games to focus your mind when the physical effort gets tough? There are always going to be unanticipated challenges when you run an ultramarathon. Your best success strategy is a positive, flexible, problem-solving mind-set. When you pack this attitude you’re sure to have a great experience! 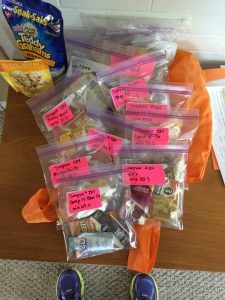 Example of how to pack aid station supplies for crew to give the runner.